Over the past few years it’s become fashionable in sophisticated political circles to argue that presidential campaigns themselves barely matter. What matters is the economic fundamentals. When the economy is strong, the incumbent party wins. When the economy is lousy, the incumbent party loses. All the rest is just a bunch of sound and fury, signifying nothing. I’ve long had some problems with this attitude. I don’t think there’s any question that the state of the economy matters, and I agree that political journalists probably ought to pay more attention to this than they usually do. At the same time, it’s easy to go overboard. For one thing, political scientists have come up with a lot of different models, and they don’t all rely on the same economic measures. Nor do they make the same predictions. Nor do they even claim (in most cases, anyway) to explain more than about 60-70% of the variance in how well the parties do. 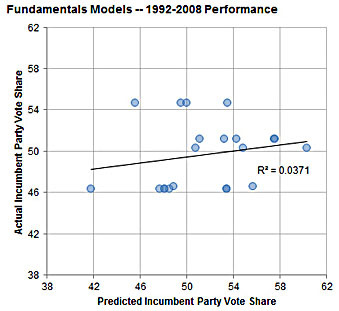 So even if the models are accurate, there’s plenty of scope for other factors to influence presidential elections too. In total, 18 of the 58 models — more than 30 percent — missed by a margin outside their 95 percent confidence interval, something that is supposed to happen only one time in 20 (or about three times out of 58). Across all 58 models, the standard error was 8 points of vote margin or 4.6 points of incumbent vote share. That was much larger than the error that the models claimed they would have — about twice as large, in fact….The “fundamentals” models, in fact, have had almost no predictive power at all. Over this 16-year period, there has been no relationship between the vote they forecast for the incumbent candidate and how well he actually did. Nate argues that the state of the economy does have some predictive power. He figures it at about 40%, but says that most current models don’t even do that well because they’re poorly designed. That doesn’t surprise me: this is a really hard subject with lots of hard-to-answer questions. What matters most, the absolute state of the economy or whether it’s on an upswing/downswing? Should we look at GDP growth or unemployment? Or something else, like disposable income? Do voters respond to some variables, like inflation, only when they get above a certain level? Etc. This is hard stuff, and we don’t have a whole lot of data points to work with. All of this is one reason why I’m reasonably optimistic about Obama’s chances in November. Yes, the economy is still in weak shape. But it’s improving, which I suspect is at least as important as its absolute level. What’s more, his party has been in power for only one term and he’s a strong candidate running against a weak Republican field. Put all that stuff together, and I think his odds look pretty good. Bottom line: the economy matters, but it’s probably wise not to get too deterministic about these things. Monocausal explanations are often appealing, but just as often wrong. The world is a complicated place.